Coronado Ferry Landing Art Fest will be held in San Diego at Coronado Ferry Landing. This event will feature artists presenting their original work in all medium of fine art and fine craft. Acceptable artwork includes paintings, photography, mixed media, animation, sculpture in all mediums, glass, wood, clay, fiber, jewelry, and unique one-of-a-kind artwork. 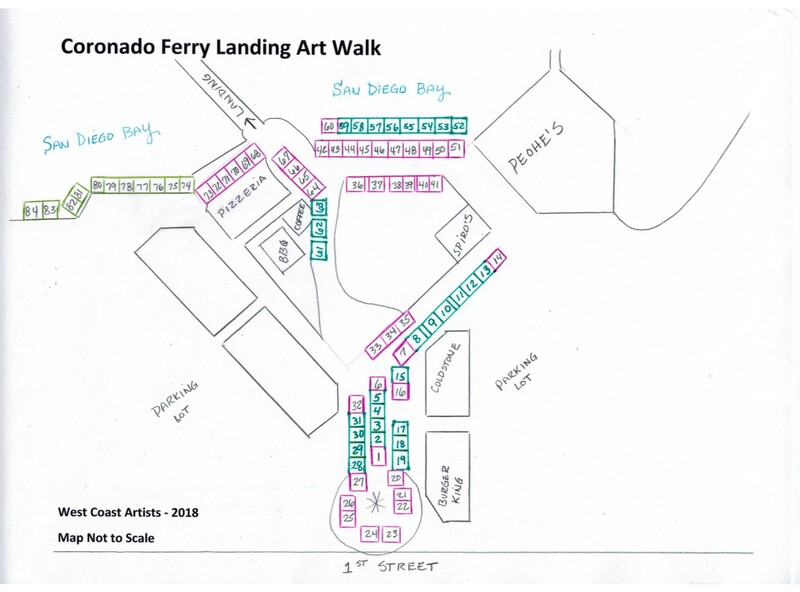 The Coronado Ferry Landing Art Fest is strictly a Juried Show and will only exhibit fine arts and fine craft. The majority of the work displayed must be original pieces. Prints demonstrated must be limited edition only and must represent a minority of the work displayed, with a majority being original pieces. Tuesday, April 16, 2019: Email notification of application status. Tuesday, April 30, 2019: Deadline for accepted artists to commit to exhibit and to remit booth fee. Wednesday, May 1, 2019: Deadline to cancel participation in the 2019 Festival to receive credit of booth fee. A maximum of 70 artists will exhibit at the 2019 event. The jury is comprised of professionals working within the art community. The panel uses a blinded jury process to review a set of four images provided by each artist. The process, materials, dimensions for each image and artist information statements are made available to the jury. Artistic excellence is the sole criteria for selection of exhibitors. The panel is convened to discuss their rankings and the artists with the top scores will receive invitations to exhibit. High-scoring artists who are not initially invited to exhibit will be added to a wait list and offered the opportunity to exhibit should an invited artist decline to participate in the Festival. * All booth spaces are sized to accommodate display tents measuring 10' X 10" for $230.00, or $420.00 10 X 20 booth. 10% commission on all sales. If you are not agreeable to 10% comission, please reconsider and do not apply. * Canopies must be white. * No electricity is provided. * Display arrangements must meet with approval of the committee. The committee is looking for balance in terms of variety of product and the way in which it is displayed. *Artists must exhibit work on Saturday and Sunday from 10 a.m. to 5 p.m.
Any artist who is selected by the jury and all returning artists must notify the Festival of intent to exhibit at the 2019 Festival and submit a booth fee by Saturday, March 30, 2019. Failure to respond by the deadline may result in revocation of the invitation and immediate invitation of an alternate from the waiting list. The applicant must keep his or her Zapp profile up to date with correct contact information, including mailing address, email address and phone number. Upon acceptance into the festival, all artists will be asked to submit a booth fee depending on your location preferrence, through ZAPP. Site Map is attached. * One (1) image must be of an outdoor display of the artist's work, showing overall continuity and presentation of your current body of work. Coronado Ferry Landing Art Fest presents original work of exhibiting artists. We do not accept mass production studios, organizations or groups. No imports, commercial, or purchased for resale work. No clothing. Exhibitors must be at least 18 years old. Space are 10' X 10' and canopies must be white. Tables must be covered to the ground. No storage of boxes or packing materials outside of booth, leave it in your vehicle if you don't have room for it. Canopies must be securely anchored/weighted, the show is on grass and concrete. Artists will conduct their own sales and sell their work at their own prices. Please no "Sale" , "Show Special", or "Discount" signs. If you are not agreeable to a 10% commssion, pease reconsider and do not apply. I have read and agree to all of the specified terms and conditions set forth in the Coronado Ferry Landing Art Fest Application. As a participant, I further release and indemnify West Coast Artists, the Port of San Diego and Coronado Ferry Landing Marketplace and all of its duly appointed representatives of liability and responsibility for any damage, injury, or loss sustained by exhibitors, guests or other participants before, during, and after the Festival or as a result of the display of my work, equipment, or materials. I understand that the Festival management reserves the right to remove anything that does not meet the standards set forth in this application. I understand that there are no refunds or rain checks due to inclement weather. I agree to accept all decisions of the Festival management. I agree to allow the Festival management use of enclosed slides, photos, and other promotional materials, including photographs and videotapes taken at each Festival for the purposes of promotion of the Festival this year and future years. The undersigned agrees to indemnify and hold harmless, West Coast Artists, the Port of San Diego and Coronado Ferry Landing Marketplace, its clients and affiliated organizations or entities, directors, officers, agents, employees, or any of the above from any and all liabilities, demands, claims, damages, or costs to property or persons as a result of participating in the 2019 Coronado Ferry Landing Art Fest. Accepted exhibitors at the Coronado Ferry Landing Art Fest may withdraw from the event 30 days prior to the event date and receive a credit toward another event. If withdrawal is made within 30 days of the event date, no refunds are available as all funds are committed to the production, promotion, and marketing of the Festival. All credit requests must be made in writing. We will not process your payments until you are accepted to the event. Canopies must be securely weighted/staked. This show is on Grass and concrete. Displays are to remain set-up until 5:00 pm on Saturday, Sunday.